The Long-anticipated Isan New Testament Is Now Finished! Ron Reads 1st Copy - Hot Off The Press! 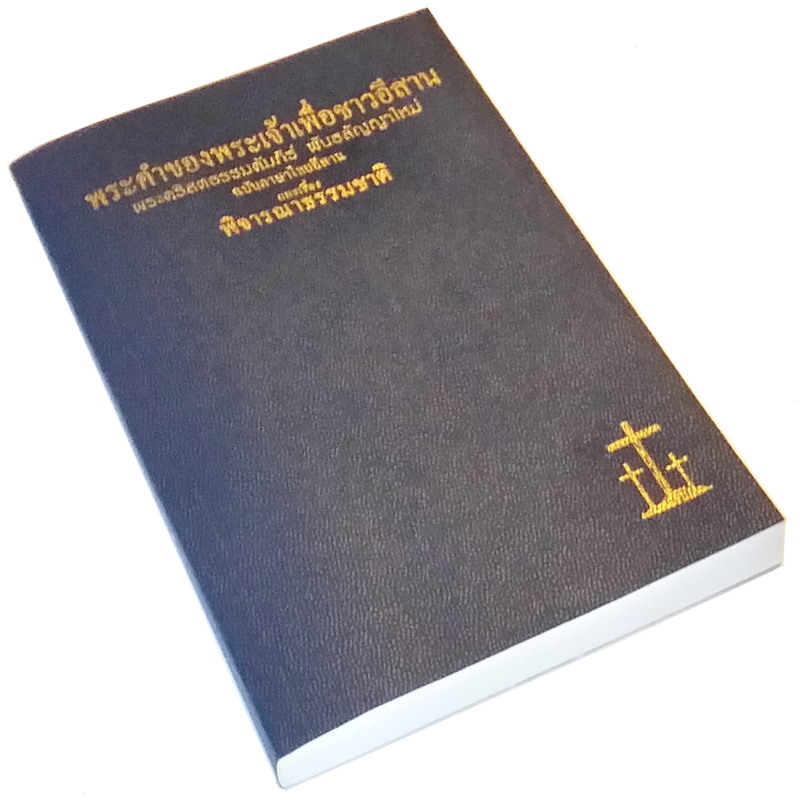 THE AUDIO VERSION (October 2017): Printed copies of the Isan New Testament are continually being requested and sent to locations around the Isan Region of Thailand and beyond. Since then, I have received numerous requests to produce an audio version. I agree, knowing that the need is genuine and enormous. 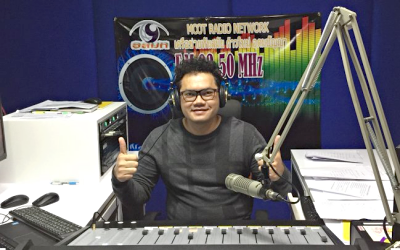 After prayer for direction, God led me to meet a local-area Isan radio DJ whose radio "handle" is Baaw Ter. Baaw Ter had received Christ a year ago, has become quite strong in the faith, and is thrilled about doing the narration in a professional manner. Upon discussing the matter, I learned of his small, privately-owned radio station facility, situated alongside his home. It became obvious that this was the best place to, not only to do the narration work, but a tremendous opportunity to do local-area Christian broadcasting as well. There was one major drawback. His radio station tower had been struck by lightning a while back, destroying all of his studio equipment. The need was obvious: rebuild his radio studio, starting with the sound room. We then about the process of restoring and upgrading the studio in preparation. Having worked tirelessly on this, Baaw Ter now tells me all the needed repairs and upgrades are done, including installing new equipment, graciously funded by God's people, for which both Baaw Ter and I are thankful. Now, having ironed out the "bugs," Baaw Ter narrated the 1st chapter of John's Gospel in December. It sounds great! 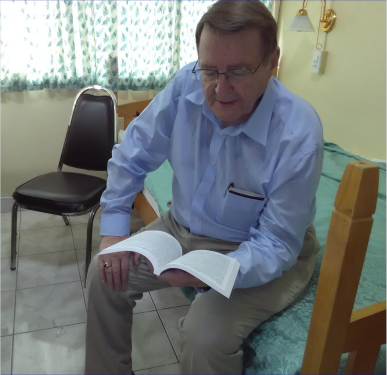 THE ISAN NEW TESTAMENT (June 2016): After decades of hard work--amidst many taxing and tedious delays--Ron and his Isan team finished translating the final verse of the Isan New Testament at 12:10 PM, December 14, 2012, Thailand time. This was followed by a two-year, indepth final review, which was completed in December of 2014. "Also, at that juncture, a well-known Bible translation mission organization asked permission to review the Isan New Testament. After doing a spot-check review, they concluded that it met their criterion for Bible translation." Then, after returning home, Ron took a necessary health sabbatical to replace a severe osteoarthritic left hip. Due to doctors orders, Ron wasn't able to return to Thailand as soon as he desired. Upon his return in late 2015, Ron and Pastor Pitak did some finishing touches on the Isan New Testament draft. They then prepared proofreading copies of the completed text, which they gave to their proofreading committee consisting of four Isan Christian ladies. After returning to Thailand in the spring of 2016, Ron and Pastor Pitak reviewed the notations or comments in the four proofread copies (1,200 A4-sized pages in total), making any needed adjustments or clarifications to the final draft. Then came the tedious job of arranging the 500-page Isan New Testament in proper format, with individual headings for each New Testament book. Printing was done in late May, 2016, by a Christian-owned printshop in Bangkok. The printer did a superb job, implementing high-quality imported materials, producing a first edition printing of 10,000 copies at a very reasonable cost. The initial 1,600 copies were trucked overnight (by a Christian-owned trucking firm) to our translation headquarters in Nakhon Phanom province, Northeast Thailand. They arrived just one day before our catered Dedication and Presentation Celebratory Event, held on June 2, 2016. Between 40-50 Isan Christians, pastors, missionaries, and donors were in attendance. It was a great and memorable occasion, albeit surreal for Ron after having spent seemingly endless years of toil to see the task through to completion. Each attendee took packages of Isan New Testaments home as needed for local distribution. 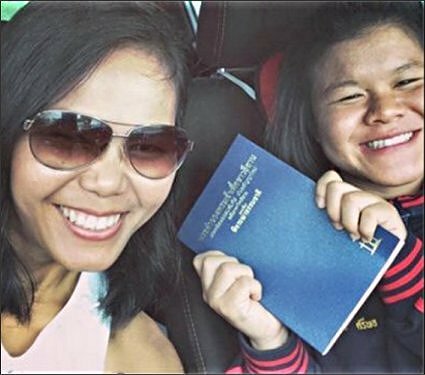 A Thai pastor friend volunteered to help oversee the distribution of the remaining Isan New Testaments throughout Thailand's Isan Region. Since then, we have received numerous positive reports from missionaries, Isan pastors, and Isan Christians alike, including repeated orders for more Isan New Testaments. One lady missionary writes: "A while back, my ministry partner and I met two women while we were sharing the gospel with and praying for the sick. We prayed for them and gave them a Bible in their own language [an Isan New Testament]. Soon after, they chose to follow Christ!" Read or download - PDF format. Use "Back Button" to return here. "Good job, I enjoyed listening and learning from the program. You are a professional! Keep up the good work." What Is the Task of a Missionary? The primary task of every Bible-believing missionary is to master the language and communicate the changeless truths of the Gospel of Jesus Christ in its entirety, clearly and accurately, in the heart language and culture of the target audience. (1 Cor 15:1-8) Including the foundational Creation-to-Redemption account. What Isn't the Task of a Missionary? What Is the Gospel Message About? The Gospel addresses lost humankind with a positive message of help, hope, and forgiveness through the gracious provision of a loving and merciful God who offers salvation from sin, judgment and death by simply placing one's trust in the Name, Person, and Work of the Lord Jesus Christ. Thus, forgiveness of sin and restoration to a right standing with God the Father is received through simple, heart-felt trust in Christ's work on our behalf, apart from human striving or effort! What Isn't the Gospel Message About? Embracing a works-oriented personal piety, based on a series of self-imposed dos and don'ts, is not the same as embracing the Gospel. No matter what you may call it, it's still mere religion. Simply a man-made substitute for the real thing. In other words, relying on or trusting in religious practices or personal performance of moral or religious acts can never save you, because it is not the authentic Biblical message which is the gracious Love and Forgiveness of God, personified in the Name, Person, and Work of the Lord Jesus Christ! That is, God reaching down through His only begotten Son, the Lord Jesus, to provide Salvation (full and free) to an utterly and hopelessly-lost humankind. The Lord Jesus died on the Cross, in our place, to pay the price for our sins (the Just One for the unjust sinner). He then rose bodily from the tomb on the third day, declaring victory over sin and death; therefore justifying every lost sinner who believes before a Righteous and Holy God... transforming that one from being a lost sinner to becoming a Saint in God's sight! Therefore, Salvation is not lost humankind seeking to justify himself or herself by trying to build a path up to God through their own human effort This is not acceptable in the sight of a Righteous and Holy Creator-God, no matter how virtuous or self-satisfying it may seem to the one who seeks to practice whatever it is he or she is trusting in! God, by His loving-kindness, has already provided Salvation as a free gift. All we can do to gain this wonderful gift is to open our hearts and receive it with humility and thankfulness. "E-mail us! We'd enjoy hearing from you." Baptist World Missionary Outreach Min. "A Congregation of Baptist Believers"
Concerning Speaking the Language, Ron States: "I often chuckle a little under my breath when I get asked whether we speak the language. I assure you that we do. In fact, how could we ever hope to minister effectively if we didn't speak, read and write the Thai language, as well as two regional languages. Mastering both the national, and any local-area language, the culture, and befriending the people we go to reach is an absolute essential for every serious-minded missionary... certainly not just learning the national language, or trying to communicate in English through an interpreter! To say that this required a lot of time and effort would be a gross understatement. Yet, the rewards were great in terms of their accepting us; and, their understanding the life-changing message we brought, i.e., the Good News concerning the sin-bearing Savior of the world, the Lord Jesus Christ. Bottom line: Fluently speaking the heart language of the people one ministers to is absolutely mandatory, because nothing else has the same impact or ability to fully communicate the intended message to the listener's inner being!" 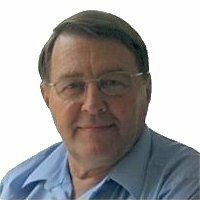 Ron Adds, Concerning Our Work: "After completing extensive ministerial training and my ordination, Cheryl and I began our church planting ministry to Thailand in 1973. The area of Thailand where we have invested our lives is known as the Northeastern or Isan (E'sahn) Region. Our ministry began by living in a remote rural area where villagers had absolutely no modern conveniences, including only unimproved roads and no electricity. In 1981, we relocated to the provincial capital of Nakhon Phanom where our ministry expanded to include evangelism and church planting reaching into in a wider area. This included pastor-teaching at a struggling city church and training a new pastor until it got back on its feet; and, most importantly, initializing the translation of the New Testament into the Isan language. "By God's Grace, I finished this long-term project, including performing an indepth edit-review, proofreading, formatting in book format and printing the Isan New Testament in June, 2016. It is now being distributed throughout Thailand's vast Isan Region, which comprises one-third of Thailand's total population and landmass. Today, there are over 25-million Isan-speaking people who never before had the Word of God in their own heart language, apart from the work the Lord has me doing. We are now recording the finished Isan New Testament in a professionally-narrated audio format, being done by a radio announcer who is an Isan Christian man. I also develop and distribute culturally-relevant evangelism and teaching materials in both printed and audio format." WHO & WHAT IS OUR FOUNDATION? OUR FORCE? OUR SOURCE? OUR SUFFICIENCY? OUR STRENGTH? "NOTHING IN MY HANDS I BRING, ONLY TO THY CROSS I CLING," needs to be our contrite attitude. "Motivated by the VISION of God's all-encompassing love for all people, empowered by the Holy Spirit, and in obedience to the Great Commission of the Lord Jesus Christ, we are committed to the PURPOSE of expediting God's eternal, life-giving Word into the hands, hearts, and lives of the over twenty-three million Bibleless Isan people who dwell in Thailand's vast northeastern region, translated faithfully and accurately into their own heart language, following the Byzantine/TR text form. "Therefore, this website is DEDICATED to providing you, our supporters, with enlightening and relevant information about the Isan people, their background, their culture and religious traditions, their needs, and their current situation, as well as details (FAQs) concerning principles being followed in translating God's Holy Word into their everyday heart language. "Now, after over twenty years of dedicated work, the Isan New Testament is COMPLETED, checked, reviewed, proofread, and has now been printed (May 28, 2016) by a Christian-owned print shop in Bangkok. A dedication and presentation celebration for the Isan New Testament has taken place (June 2, 2016) in Nakhon Phanom Province--our headquarters--and to that end, it is presently being DELIVERED into the hands and hearts of the Isan masses of Northeast Thailand." 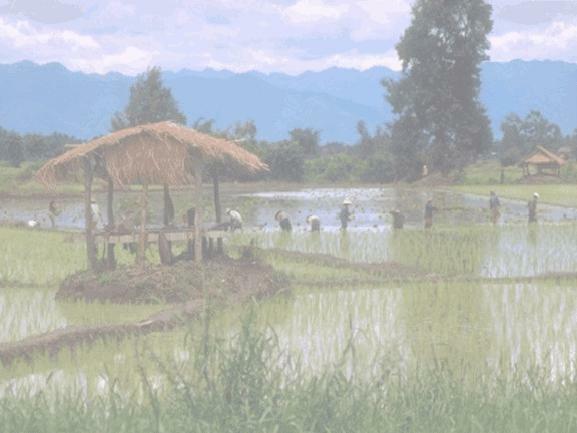 The Mekong (or Isan) Bible Translation Project, i.e., "God'S Word For Isan," operates entirely by faith in God's provision. We also realize that God typically provides for His Work through the generosity of His People—The Body of Christ. This means that all Church planting & Bible translation projects are provided for, both through unsolicited one-time contributions, and especially through monthly gifts from like-minded groups and individuals, who delight to partner with us to see this vital task through to completion. These gifts are channeled through our mission organization's home office: Baptist World Missionary Outreach Ministries (BWMOM), PO Box 3303, Chattanooga, TN 37404. Incidentally, BWMOM is a fully-qualified and registered 501(c)(3) not-for-profit, faith-based Christian organization. As such, BWMOM is legally authorized to issue tax-deductible receipts for contributions, provided in the form of a year-end statement to each donor. Projected Completion Goal is Summer, 2016 (with your participation). And, there is much more left to do afterwards. Taking God's Word — the message of His Forgiveness and Salvation (in Christ) to All Peoples (Faith Comes By Hearing the Word... - Romans 10:17). Want to do something worthwhile with your life? "I have learned by personal experience that: the greatest privilege, the greatest blessing, the greatest job, the most rewarding endeavor, the most important task in all the world that gives the greatest personal joy and complete satisfaction... is to give one's life to obey the Great Commission and serve the Lord Jesus Christ, having an integral part in taking God's eternal, life-giving Word, and message of Salvation to those still waiting in the depths of spiritual darkness at the uttermost, unreached ends of the earth — until Christ returns!" R.M.